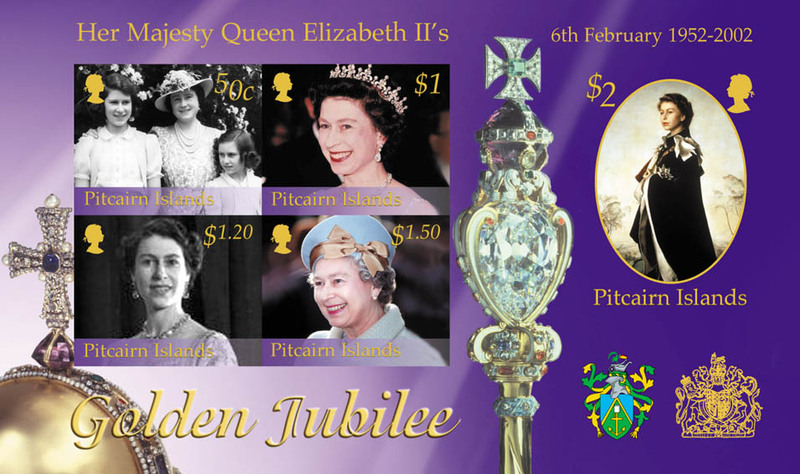 Together with a number of other postal administrations, and in co-operation with the Crown Agents Stamp Bureau, the Pitcairn Islands are to release this issue to celebrate the Golden Jubilee of the accession of Her Majesty Queen Elizabeth II. During 1951, Princess Elizabeth was more frequently assuming the role of her father King George VI, whose continued ill health caused him to be seen less on state occasions. It was early during a planned Royal Tour of Australia and New Zealand, while en route in Kenya, that Princess Elizabeth and Prince Philip were to learn of The King’s death in the early hours of 6 February. Her Majesty Queen Elizabeth is the forty-second Sovereign of England, since the Norman Conquest and the sixth Sovereign Queen. The transition from princess to monarch was rapid. Frantic arrangements were made for Her Majesty’s safe return to England whereupon touching down at Heathrow on the afternoon of 7 February, The Queen was received by the Prime Minister, Winston Churchill and senior members of the Privy Council. The funeral of King George VI took place at Windsor Castle on 15 February 1952 and it was only after this that formal plans for the Coronation could begin. The souvenir sheet bears images common to all countries participating in this omnibus issue. The Annigoni portrait on the $2.00 stamp and the orb and sceptre, both traditional symbols of the monarchy, feature on each country’s souvenir sheet. The Sovereign’s Orb dates from the coronation of Charles II in 1661 and is made from unmarked gold set with over 600 precious stones and pearls. It weighs 1.32 kg and is 16.5cm in diameter. The Sovereign’s Sceptre also dates from 1661. It is 92.2cm long, mainly gold and decorated with champlevé enamel and 393 precious stones, including the Cullinan diamond. At just over 530 carats, the Cullinan diamond is the largest cut diamond in the world.